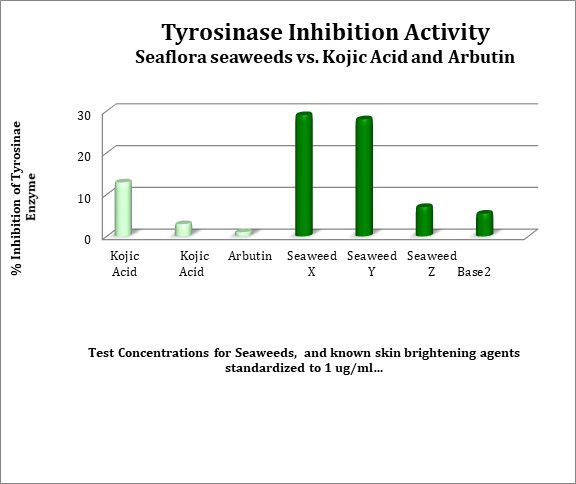 A Scientific Discovery in Unique Kelp Bioactives, that treat and prevent hyperpigmentation. 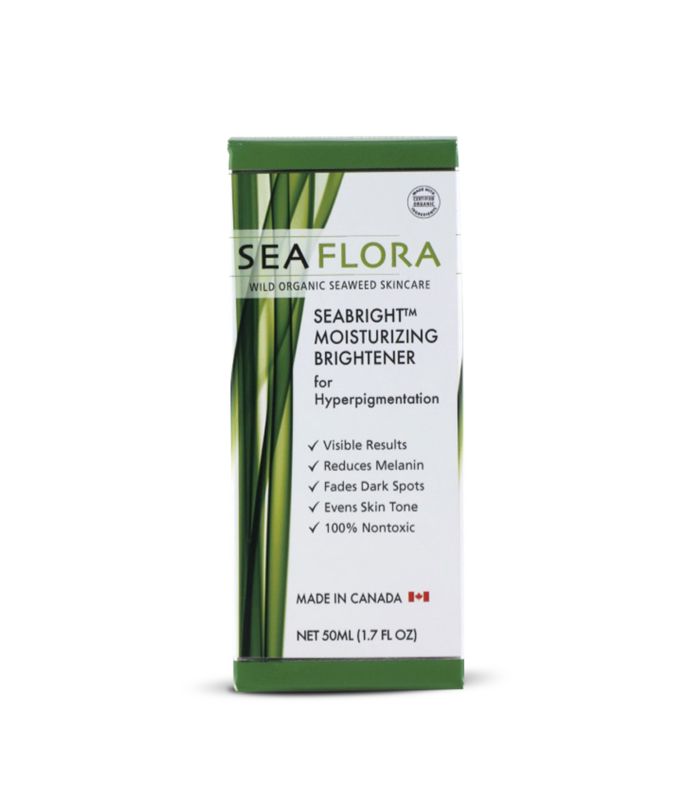 Seaflora’s new skin brightening formula is the result of 4 years of development working with the National Research Council of Canada. 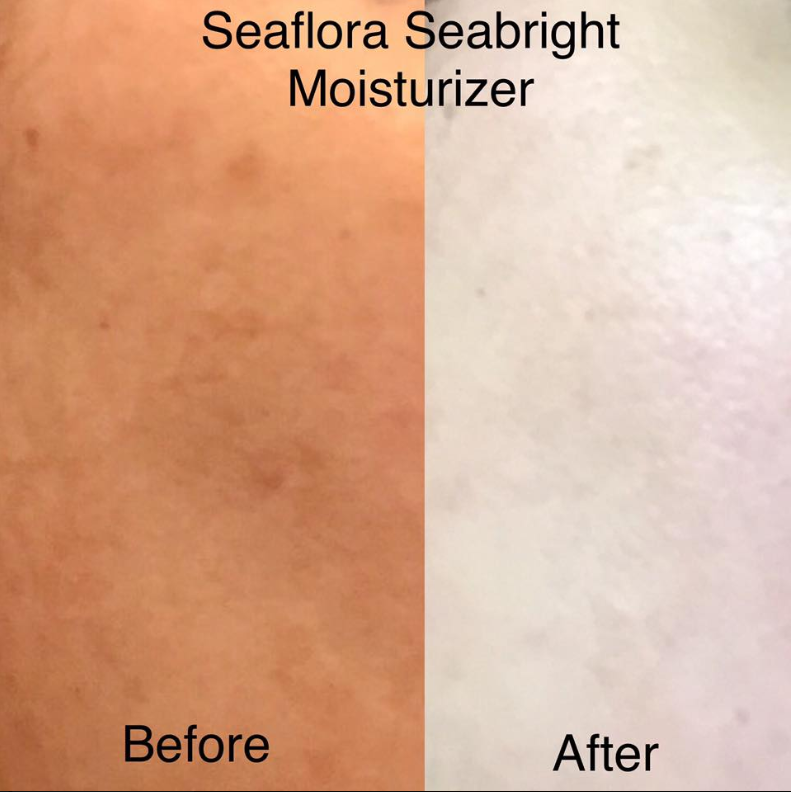 Seabright™ Moisturizing Brightener has a potent combination of unique kelp bioactives to decrease melanin and target hyperpigmentation. These potent marine bioactives create the most powerful skin brightening solution to date! Skin colouration is largely due to the presence of melanin pigment. Melanin production is largely controlled by the tyrosinase enzyme. Skin brightening agents work by inhibiting this enzyme. (National Research Council of Canada) Natural Health Products Laboratory. 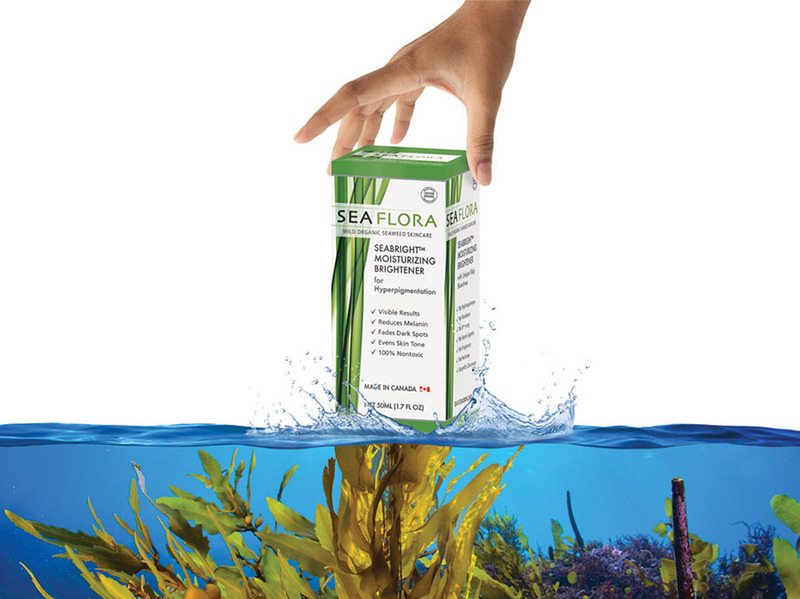 The Seabright™ kelp bioactive complex is scientifically shown to be faster and more effective at inhibiting the key enzyme tyrosinase, at lower concentrations than arbutin and kojic acid. It works in two ways – directly inhibiting tyrosinase and toning down melanocyte activity. 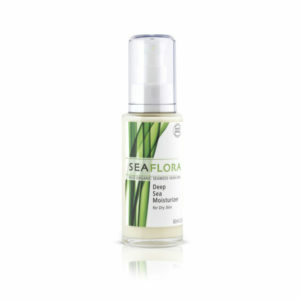 Seaflora has strategically combined the unique skin brightening capability of our bioactive kelp complex with effective natural brightening ingredients to work on the different cellular mechanisms that cause hyperpigmentation. 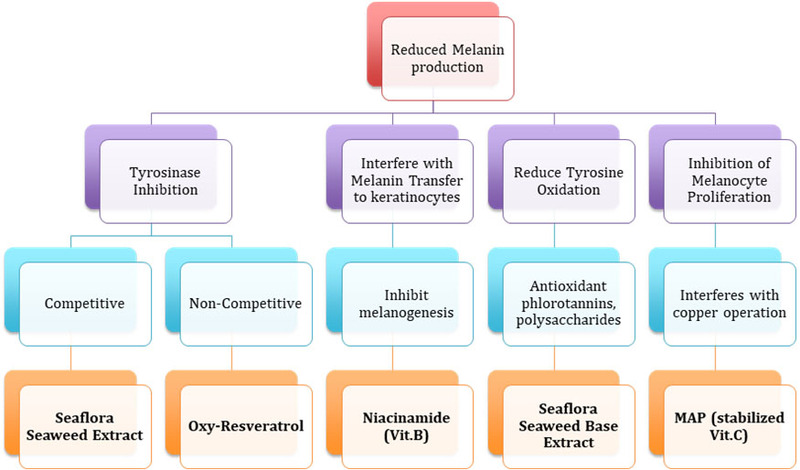 Seaflora uses a niosomal preparation of oxy-resveratrol, a natural active molecule, which enhances its skin penetration to act on the melanocytes where melanin is produced. 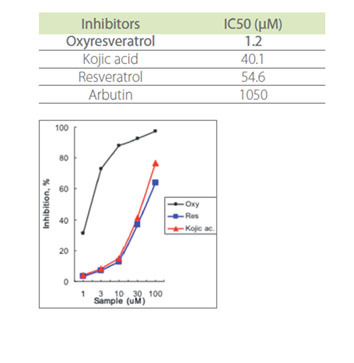 Oxy-Resveratrol ehibits greater inhibitory effect on the tyrosinase enzyme than ordinary Resveratrol, Kojic Acid and Arbutin. On the right are test results from Naturalis Life Technologies. For effective skin brightening action, SEABRIGHT™ incorporates unique seaweed ingredients and other proven and natural agents that act on several biochemical mechanisms to reduce melanin production. The Beauty Chair Inc. posted this picture on their social channels, January 18th 2019. This is their client’s result after 30 days of twice daily application. Effective! A local client in Sooke tried the product, after coming home from vacation with severe hypigmentation. “Oh my God, my skin is so bright! All of my dark spots are gone and there’s no trace of ever having sun spots! I can’t believe how good Seabright™ worked in less than 8 weeks! I can’t believe it’s made from Seaweed and it’s healthy!!! Best Lightening Cream I’ve ever tried, and so affordable. Love love love Seabright™!” – Brett McLean, Sooke B.C. Four Years of Research on Kelp Bioactives, resulting in a scientific discovery, that kelp can treat and prevent melanin. 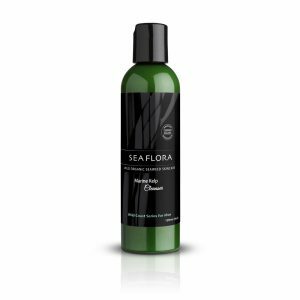 Seabright™ Kelp Complex is 100% non-toxic and more effective at lower concentrations than Kojic Acid or Arbutin.